Zao is my favorite place. 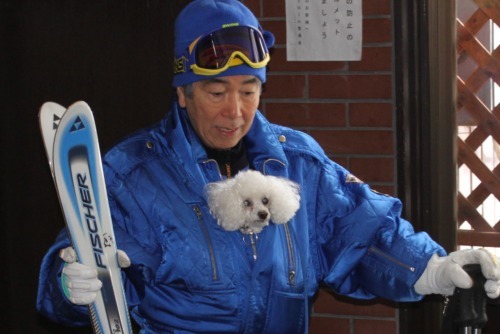 I met a distinguished skier Eizo Kishi who is the first ski demonstrator in Japan, during the season of 1961 through 1962. However he is 19 years elder than me, he let me his close friend. I wondered what he liked about. This story is at "Story of Eizo Kishi". I started Zao Ski Camp in February of 1978. 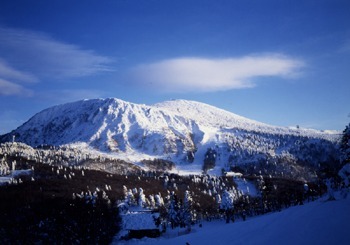 Everyone thought Mt, Zao is very far from Tokyo at that time. There was no Shinkan-sen and Tohoku-Highway yet. But my native ski area is Mt. Zao. I wanted to take my students to Zao. They were the 9th period students of my laboratory. Every time I take my family of cause with Chunchun and drive my car from Tokyo to Zao. We left Tokyo around 10 o'clock in the morning of March 11th. First stop is Nasu Highland S.A. as usual. Next stop is Kunimi S.A. We had arrived at Kunimi before 2:30. We entered in the Restaurant at Kunimi S.A. and we ordered something to eat. At 2:46, terrible earthquake attacked. The building of restaurant shook with big noisy sound. Everything on the shelves dropped to the ground. the lamps on the ceiling swung. My wife slipped under the table and screamed something. The master announced "Get out from the restaurant!". The seismic intensity was 6plus. I thought this was terrible even though I am a hebetude in the earthquake. Chunchun was waiting in our car. She couldn't understand what happened. We were staying in our car more than 30 minutes. Big aftershocks continued several times. Still, several cars hurried up and went out of SA. Chunchun skis every year. Look, this style. She likes my bosom better than left alone in the lodge. We started lately. As I imagined, there were many clucks and differences on the road. But we drove carefully from Kunimi to Shiroishi. Traffic stopped here. We waited more than one hour. Sasaya tunnel might be closed. We gave up this route and returned the way. This area has a heavy snow anytime in the winter. It falls indeed often in such an emergency. Traffic stopped again on the cross of Date Town. We decided to go to Yamagata through Yonezawa. 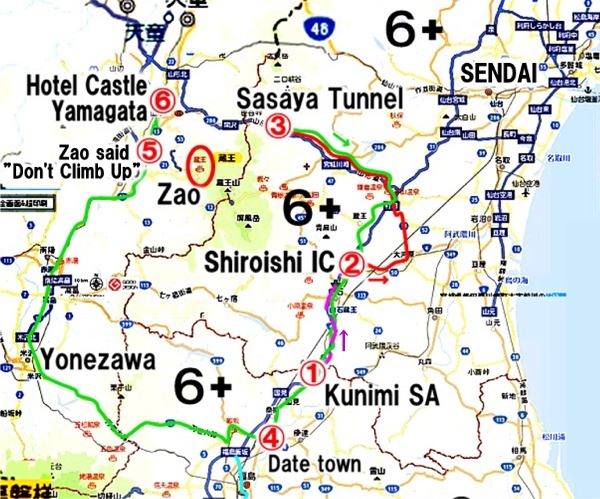 We turned to the right at the cross of Date Town and drove through Iizaka Hot Springs to Yonezawa on the Route 13. But we met traffic accidents because of signal off. Yonezawa was light. But Yamagata was dark. Electricity was stopped in Yamagata City. I called Zao at this place. 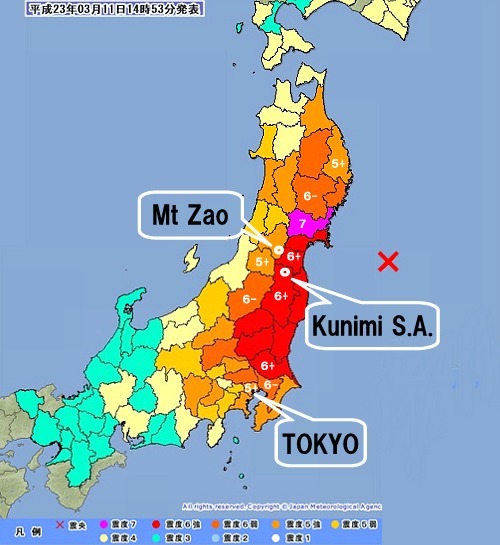 President of Ski School, Hiroshi Kishi answered "Don't climb up to Zao, The light goes out here. 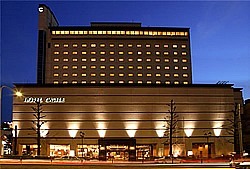 Reserve a room at Grand Hotel or Hotel Castle in Yamagata City." We reserved a room at Hotel Castle. Elevator didn't work, so we walked up to 10th floor. My wife brought tiny transistor radio and small LED light. We could hear news and LED light is useful, so light. We recommend everyone to bring LED portable light when you travel. There was a emergency hand light in the room of Hotel, but this was old fashion. Next morning, electricity had not been recovered. We decided to return to Tokyo driving ordinary road. Highway to Tokyo was closed entirely. We left Hotel at 10 o'clock. We need gasoline but Gas Stations all closed in Yamagata City. We entered Gas station at Fukushima, but they refueled only 2000Yen that is 14litter. We have to refuel soon. We found Self service Gas Station after one hour drive. We could refueled full tank. 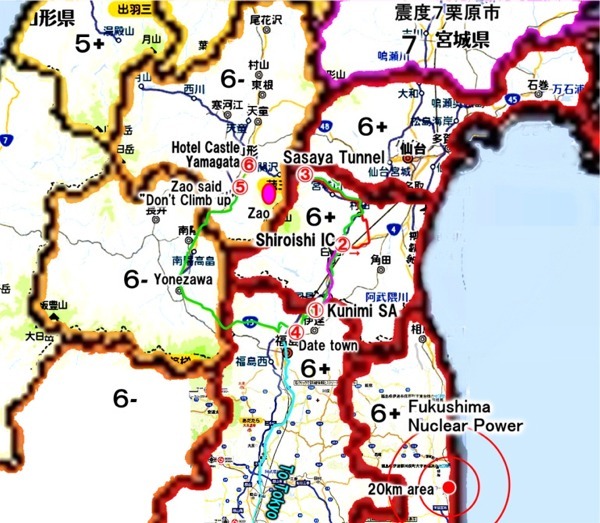 We went through Kooriyama nearest place to Fukushima nuclear power plant about 3 o'clock only 30minutes before the first explosion. There were several heavy traffic jams on the route 4. We had to detour. We arrived home at 9:30. It took 11hours and a half. My daughter and her husband waited for us preparing hot dinner. TV set fell down to the floor. Books, CDs and all the things on the shelves dropped and couldn't step ｉｎto my office.